Edmonton Oilers' Connor McDavid (97) celebrates a goal against the Anaheim Ducks during second period NHL action in Edmonton on March 25, 2018. When the flu swept through the Oilers early this season, Connor McDavid was among the victims. Unlike a few teammates, however, the NHL’s youngest team captain never took a sick day. That caused even more misery when he came down with strep throat. He had trouble swallowing, couldn’t eat or sleep, and lost 10 pounds in one week. He had a 100-degree-plus fever and his legs felt heavy. His energy level, usually akin to that of the Looney Tunes’ Road Runner, waned. McDavid played through illness, collecting roughly a point a game, but it was a long time before he felt healthy. Once he did, however, he assumed his position as the most dominant player in the sport. For the first four months of the season, he trailed the scoring leaders, and at one point even dropped out of the top 10. Then he slowly began to track them down. In February and March, he scored 26 goals and had 49 points in 30 games. He enters Saturday night’s finale against Vancouver with 106 points and the lead all but locked up for the second successive year. Three assists against Vegas in a 4-3 victory on Thursday left him eight ahead of Philadelphia’s Claude Giroux and Tampa’s Nikita Kucherov. He will become the first player to repeat since Jaromir Jagr won four times from 1997-98 through 2000-01. McDavid, who is 21, was 15 months old when Jagr won the Art Ross Trophy in 1998. 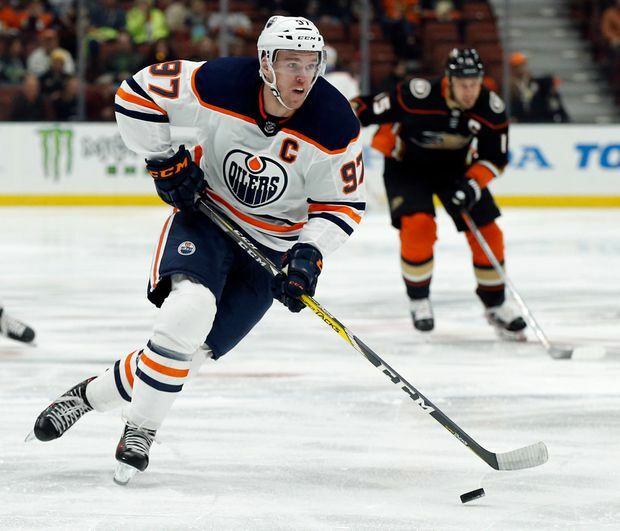 McDavid’s accomplishments this season have largely been lost in the gloom of the Oilers’ disappointing season. They have sunk in the standings after reaching the playoffs for the first time in more than a decade last summer. They are 28 points behind last year’s pace, with the Canadiens the only team that has underachieved as badly. “I know he has been frustrated,” Kelly said. Of McDavid’s 106 points, a remarkable 83 have been scored at even-strength. There is nothing wrong with the Oilers other than their defence, goaltending and a dearth of scoring behind McDavid. It will be an off-season of much contemplation for the organization. Although he shoulders the blame as team leader, Edmonton’s precipitous decline has little do with him. It is hard to fathom, but he has actually played better than a year ago, when he won the Hart Trophy as the most valuable player on any team, and the Ted Lindsay Award as the most outstanding player in the league. 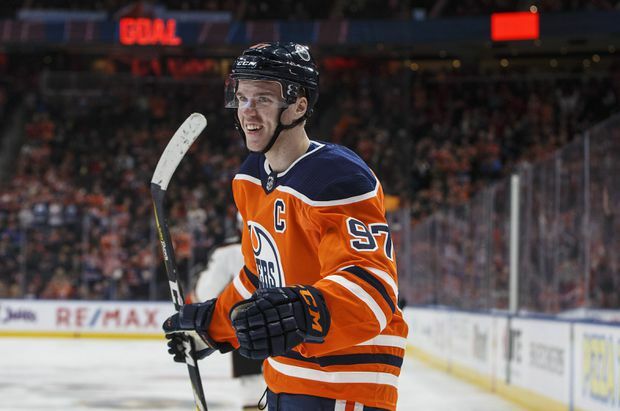 He is the first player with consecutive 100-point seasons since Sidney Crosby and Alex Ovechkin in 2008-09 and 2009-10, and the first Oiler to do it since Wayne Gretzky and Mark Messier in 1986-87 and 1987-88. He has 31 multiple-point games, the most in the NHL. Of McDavid’s 106 points, a remarkable 83 have been scored at even-strength. That is 21 more than the next-closest player, the biggest gap since 1995-96 when Jagr finished 19 ahead of Peter Klima. He has 35 even-strength goals, four more than Ovechkin. “That is absolutely insane,” said McDavid’s agent, Jeff Jackson. In December, the general manager of one NHL team confided to Jackson that he was worried about containing McDavid. “I just hope nobody tells him to shoot more often,” the general manager joked. Jackson told him he was out of luck. “A lot of us have told Connor that over the years,” he said. McDavid has taken it to heart. He enters the final weekend of the regular season with a career-high 270 shots on goal. He also has a career-high 41 goals, 11 more than a year ago. McDavid is likely to be among the leading candidates again for the Hart and Lindsay awards. His chances of winning could be derailed because the Oilers failed to reach the playoffs. “If I was voting and had no attachment to the Oilers, I would consider Connor for MVP,” said Todd McLellan, Edmonton’s coach. “He is the heartbeat of our team. On Thursday night, McDavid set up Edmonton’s first goal with a crisp pass to Ryan Nugent-Hopkins. In the third period, he set up the tying and winning goals three minutes apart. He drew a penalty on the tying goal with a hard charge to the net, and then found Mike Cammalleri in front of it a little more than a minute later. “The [scoring race] isn’t over until it is over,” he said afterward, refusing to celebrate. “These guys [trailing me] are great players. McDavid is likely to play for Canada in the world championship in Copenhagen beginning next week. After that, he will start preparing for next season. He will use this season’s heartbreak to steel his resolve for 2018-19. “I think it has been a learning experience for him, and in the future that will help him lead a team during challenging times,” Kelly said. “He tries to lead by example, which is hard at his age.